Situated along the Dolphin Coast, just 15km from King Shaka Airport, 120 luxury terraced apartments with breathtaking sea views await you at La Montagne Resort Hotel and Spa. With restaurants offering a wide variety of cuisine and room service, a great in-house Wellness Retreat, a live supper theatre club, squash courts, swimming pool, magnificent seaside sun deck and a daily entertainment programme for the whole family, La Montagne is guaranteed to fulfill your holiday dreams.The resort also boasts superb wedding and conferencing facilities with a full banqueting function, themed evenings and special activities. The modern, fully equipped and air-conditioned apartments have all the essentials to guarantee a memorable holiday. The resort features studio units, two and three bedroom apartments and luxury penthouses, all with panoramic sea views. The well-appointed open plan dining and lounge area includes a mini kitchenette to complete your comfort. The patios are equipped with a built-in braai, while the TV with DSTV channels will ensure that you never miss your favourite movies or sporting events. 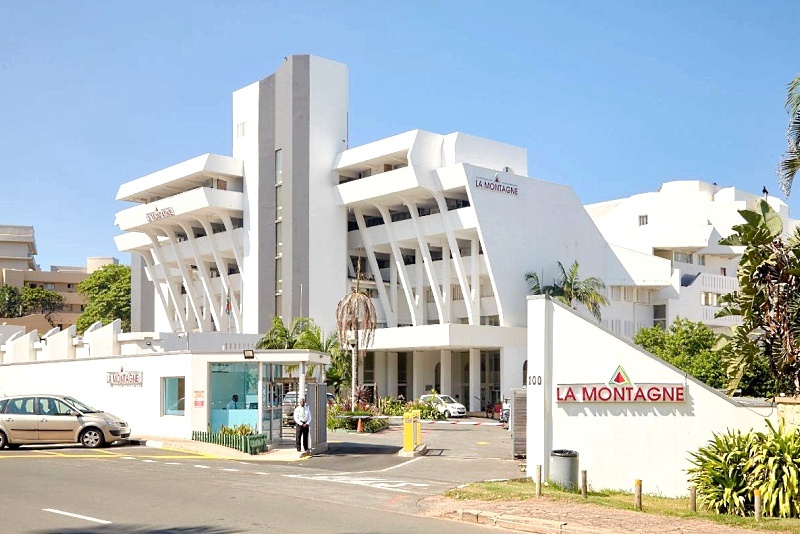 La Montagne is currently being totally revamped to five-star standards, with luxurious modern finishes and furnishings, the latest appliances and contemporary décor on the cards for all the apartments. These studio apartments accommodate two in an open-plan living arrangement with either a king-size or a queen-size bed, mini kitchen and dining area. Our 2-bedroom apartments sleep four guests. They have a double bed in the main room, and two single beds in the second bedroom. Featuring a full bathroom which includes a toilet, overhead shower, basin and a bath. This spacious duplex apartment has 3 bedrooms and 3 bathrooms. The main bedroom has a double bed and bathroom en-suite, the second bedroom has two single beds pushed together (with a bathroom en-suite) and the third bedroom (downstairs) has two single beds and a bathroom with a shower, basin and toilet. The newly refurbished studio apartments, offering sea views, accommodate two in an open-plan living arrangement with either a king-size or a queen-size bed, mini kitchen and dining area. Our recently upgraded 2-bedroom apartments, offering sea views, sleep four guests. They have a double bed in the main room, and two single beds in the second bedroom. Including a full bathroom which features a toilet, overhead shower, basin and a bath. The spacious three bedroom apartments have a double bed in the main bedroom (with bathroom en-suite), two single beds in the second and third bedrooms respectively, and a second full bathroom. Boasting sea views, the 2-bedroom apartments accommodate four guests. They include a full bathroom which features a toilet, overhead shower, basin and a bath, they have a double bed in the main room, and two single beds in the second bedroom. Boasting sea views, our studio apartments, with mini kitchen and dining area, sleep two in an open-plan living space on either a king-size or a queen-size bed. Boasting sea views, our newly refurbished, large three bedroom units have a double bed in the main bedroom (with bathroom en-suite), and two single beds in the second and third bedrooms respectively. They include a second full bathroom. This state-of-the-art supper theatre club thrills audiences with spectacular musical, comedy and dramatic productions and a variety of mouth-watering fare. The Pumpkin Theatre Supper Club is a seasonal venue and advance bookings are essential to avoid disappointment. Boasting intimate fine dining as well as a comprehensive à la carte menu with a delicious array of exotic seafood dishes, curries and more. Crayfish Inn is situated upstairs in the tower at La Montagne. Don't miss out on this exquisite seafood extravaganza. Tempt your taste buds with a snack at The Palm Terrace restaurant, situated alongside the swimming pool area. Open for breakfast, lunch and dinner, we serve an array of treats to satisfy the discerning palate. The area around the pool is the ideal setting in which to relax and treat yourself to a sundowner. Enjoy a cocktail or a light snack overlooking the pool. Catch some rays and take in the poolside fun and ocean air while you enjoy your refreshments. The B-Bar is centrally situated for the utmost fun and relaxation in the middle of all the La Montagne action. The Johnny Walker Conference Room is designed for all your conferencing needs, with a number of possible configurations, from 50 people in a u-shape, 100 people in a school room and banqueting layout, 150 people cinema style and 80 people herringbone-style. The elegant Crayfish Inn Meeting Room is perfect for all your meeting requirements, with a number of possible configurations - from 25 people in a u-shape, 40 people in a school room set up, 30 people in a herringbone shape, and 50 people cinema-style. La Vita Spa provides a world class facility for guests to enjoy a wide range of wellness massages, anti-ageing treatments, manicures and pedicures, available to men, women and children. There is no shortage of things to do at La Montagne. When you are not enjoying a jog on the beach or water sports, you can play squash or hire a bike and go exploring. Whether you prefer to braai on your private patio or head for the poolside braai deck to stoke up a traditional charcoal fire, La Montagne offers superb opportunities for al fresco dining. The children’s entertainment area provides hours of fun for the younger set, including a jungle gym, table tennis and a games arcade – perfect for entertaining the younger set while you relax on holiday. Head to one of our welcoming bars for sundowners or after dinner drinks, to socialize and catch up on the latest sporting events with fellow sports enthusiasts. Our bars offer all the most popular brands of whisky, brandy and beer, along with non- alcoholic refreshments. Step out of the resort onto the golden sands of Ballito’s beaches, where you can take to the waters, explore the rock pools, relax in the sunshine, fish or build a sandcastle with the kids at your leisure. Popular Compensation Beach is just a short stroll away. Children love the Flag Animal Farm with its cuddly creatures, pony, horse, train and tractor rides, milking shows, jumping castle, indoor play centres, wolf interaction, bike track, outdoor playgrounds and tea garden serving delicious drinks and tasty treats. The experienced guides at Crocodile Creek will entertain, educate and amuse you with fascinating crocodile demonstrations. Bush walks, paintball and a snake display are also on offer and the onsite restaurant serves up simple snacks and refreshing drinks. The Dolphin Coast is home to excellent golf courses, most of them with sea views, including Zimbali Country Club; Maidstone; Simbithi Country Club; Umhlali, Mtunzini, Beachwood and Princes Grant - all highly rated, scenic courses. Willard Beach has Blue Flag status and is one of Ballito’s best, with safe swimming zones and lifeguards, and is also protected by shark nets. Follow the 2.4 km boardwalk southwards along the shoreline for an easy stroll with beautiful views of bays and coves. Experience adventure from a bird's point of view, just 17km inland from Ballito. On this eco-adventure, you will slide along steel zipline cables from platform to platform across the Sampoya River, or ‘para-zip’ while attached to a parachute and zipline. Gateway offers fashion, fun, variety and entertainment for the upmarket shopper with over 400 shops, 70 restaurants and a fun fair. The shopping centre has everything under one roof for the techno savvy, the fashion forward, party animals, and socialites. Sibaya Casino and Entertainment Kingdom, located between Ballito and Umdloti, offers a technologically advanced casino, a fusion of culinary delights, sublime shows, amazing events, the world-class Mangwanani Spa and ever-evolving winning opportunities. Umhlanga Beach is a wonderful seaside playground, one of KwaZulu-Natal's most popular beaches with safe swimming, warm waters and brilliant weather almost every day of the year. A stroll along the paved walk leads up to the iconic Umhlanga Lighthouse. The Wave House, located at The Gateway Theatre of Shopping in Umhlanga, is one of South Africa’s hottest entertainment venues often host to live bands and shows, featuring the mighty D-Rex wave rider, super tube and two beach-break Flowriders for beginners. Aqua Rush is a professional, fun dive charter, offering a range of exciting activities for everyone, whether you’re a diving enthusiast or just looking for adventure. We have it all, from scuba diving, snorkeling, spear fishing, shark cage diving, harbour tours or leisure charters. Pharmacies, doctors and hospitals are 5 minutes' drive away in Ballito. While all our resorts endeavor to be accessible to all guests, please contact the resort in advance if you have any special requirements. La Montagne has a reputation for catering to all your eventing needs effortlessly and professionally. Our team of dedicated co-ordinators will take any of your requirements in their stride – from themed events to custom menus, intimate dinners to five-star events. There is no limit to the variation of functions which can be hosted at this prestigious property, with a range of indoor and outdoor venues to suit your needs, including a theatre and a large deck overlooking the ocean. A wealth of diversions are found onsite, such as a wellness spa, large swimming pool, restaurants and a supper theatre to add interest and diversity to any wedding, conference or team-building occasion. Perfect for larger conferences, this venue of 9.7 x16m accommodates up to 130 people in a range of configurations to suit your needs. Perfect for auditions, weddings, banquets, concerts and team building events, this large venue accommodates up to 110 people in a 19mx6.5m area. This spacious outdoor area of 6mx4m seats up to 30 guests for a conference, banquet, cocktail party or informal gathering. This smaller 10mx6m room lends itself to meetings, get-together's and brainstorming sessions, and seats up to 60 people. Perfectly located and beautifully equipped to host your special day, La Montagne is a destination par excellence to meet all your wedding requirements. With its premier location right on the golden sands of La Montagne’s Willard Beach, this property provides numerous additional facilities to add flair and elegance to your wedding. A choice of both interior and exterior venues, superior accommodation, a professional eventing team, superb restaurants and elegant bars are all at hand to ensure a memorable wedding at La Montagne. More Holiday Resort Accommodation in Ballito Central.